Blue skies and a perfect, sunny day on Thursday, August 30 helped to usher in the 16th annual New School Welcome Block Party, which marks the beginning of the academic year. Students, staff, and faculty from across the university as well as our neighbors filled the block on 12th Street between 5th and 6th Avenues with live musicians from The New School for Jazz providing the soundtrack. 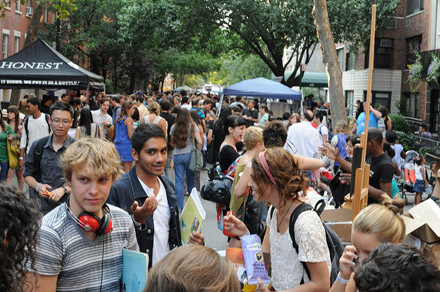 Student Development and Activities (OSDA) coordinates this annual event, which provides the university community with the opportunity to learn about the many services and resources available at The New School and the surrounding neighborhoods. Twenty-eight student organizations were on hand to encourage students to get involved in on-campus activities including the University Student Senate, Lang Student Union, and Parsons Student Senate. Additionally, 16 departments and 14 community partners provided information and freebies to attendees. Chartwells, the university’s catering service, oversaw an eclectic variety of food vendors serving traditional festival foods along with a selection of complimentary beverages. Highlights included an arts and craft project provided by Blick Art Supply in the form of a small white car: visitors used paint and markers to decorate the car and show off their artistic talents. Student Health Services invited students to list action items on a poster entitled “I will….,” creating a collective piece of art. The Corbin Hill Road Farm, founded by New School faculty member Dennis Derryck, offered delicious cantaloupe delivered fresh from the farm. There was also a brief appearance by Spiderman. Other community partners in attendance included McBurney YMCA, Food Bank for NYC, LGBT Community Center, Allied-THA, Utrecht Art Supply, League of Women Voters, Metropolitan Museum of Art, Be The Match (a non-profit organization that matches life-saving donors with patients in need of marrow transplants), and the Rubin Museum of Art.